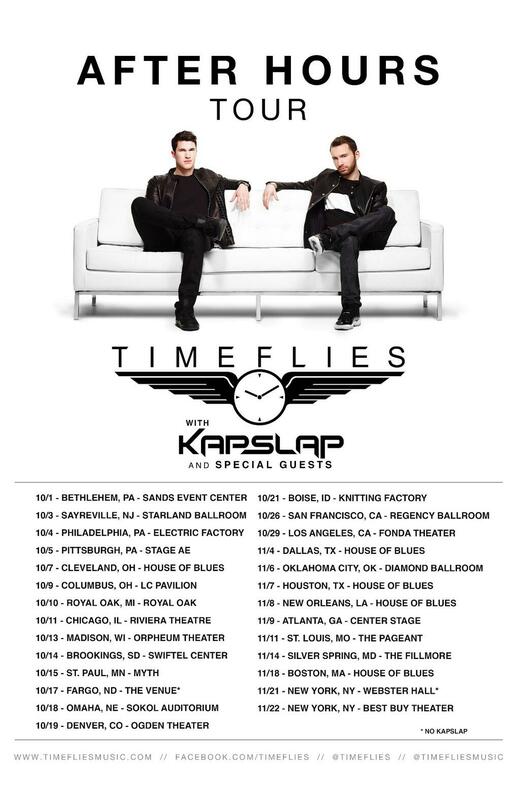 Timeflies, an electro-pop duo from Boston, will be kicking off their “After Hours” tour at the Sand Bethlehem Event Center on October 1st, the venue announced. Opening will be Lehigh graduate Kap Slap. Timeflies’ latest album After Hours debuted in late April, hitting #8 on the Billboard 200 chart. Their two singles off of the album, “I Choose U” and “All the Way” have hit #6 and #48 on the Billboard Hot Dance charts. Joining Timeflies is Lehigh University graduate Jared Lucas, better known as Kap Slap. His name comes from a drink that Kappa Alpha at Lehigh is known for: a funnel chug of beer and a shot of rum at the end. He graduated from a five year Integrated Business and Engineering program at Lehigh in 2013 with honors. Even as a Lehigh student, Kap Slap was travelling around the United States playing shows and festivals. Tickets for the show are $29.50 and go on sale Friday.